Preheat your oven to 350 degrees F. Line a rimmed baking sheet with parchment paper (or aluminum foil sprayed with cooking spray). Combine meatloaf ingredients in a large bowl just until combined (do not over-mix). Shape into a loaf (approximately 9 inches in length and 2-1/2 inches height) on prepared baking sheet. Combine sauce ingredients in a small bowl. Pour 1/2 of sauce into a separate bowl (for brushing meatloaf when it comes out of the oven). 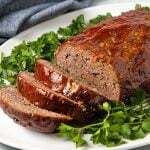 Brush meatloaf with 1/2 of sauce. Bake for 1 hour, or until internal temperature reaches 160 degrees F.
Remove from oven and brush (using a clean brush) with remaining 1/2 of sauce. Allow to rest for 10 minutes before slicing.